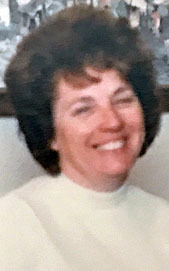 Funeral services are scheduled for 10 a.m. Saturday, May 6, at Terpening & Son Chapel for Patti Meinke of Artesia. Meinke, 79, passed away Wednesday, May 3, 2017, at San Pedro Nursing and Rehabilitation Center in Artesia. Ty Houghtaling will officiate at the services. Pallbearers will be Ty Meinke, Ian Meinke, Kent Bratcher, Jay Francis, Kevin Wilbanks and Lee Blevins. Honorary pallbearers are Don Carter, Jimmy Graham, Albert Bach, Gerald Cass, Russell Callen, Warren Harris and Danny DeHoyas. Patti was born Jan. 22, 1938, in Holdenville, Okla., the daughter of Harlin Grover and Velma (Wallace) Webb. On July 10, 1955, she married Marvin “Mike” Meinke in Artesia. She was a housewife, a member of Immanuel Lutheran Church, and loved her children and grandchildren. Survivors include her mother, Velma Webb, of Roswell; sons John H. Meinke and wife Colleen of Midland, Texas, and Owen Meinke and wife Debbie of Artesia; daughter Michelle Brown and husband Marlin of Clovis; grandchildren Bonnie Meinke and husband Steve Segal, Piper Goodnight and husband Kienan, Ian Meinke, Ty Meinke, Hunter Brown and Halle Brown; and five great-grandchildren. She was preceded in death by her husband, Mike Meinke, on Sept. 18, 2014; and her father.